ICE returned 3,800 ancient artifacts, including cuneiform tablets, cylinder seals, and clay bullae, to the Republic of Iraq. The artifacts were smuggled into the United States in violation of federal law and shipped to Hobby Lobby Stores, Inc, a nationwide arts-and-crafts retailer. Contributed photo. 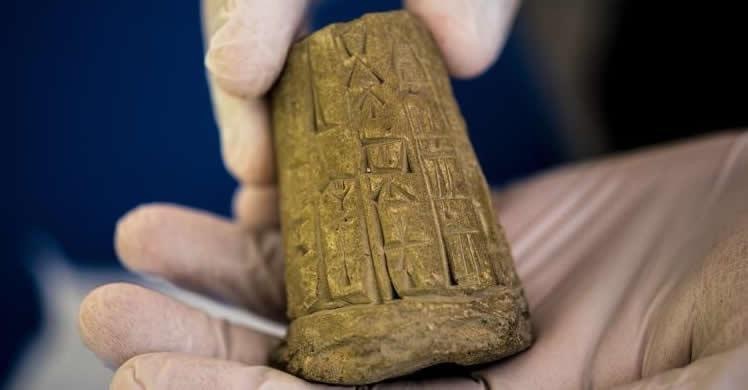 U.S. Immigration and Customs Enforcement returned 3,800 ancient artifacts, including cuneiform tablets, cylinder seals, and clay bullae, to the Republic of Iraq. The artifacts were smuggled into the United States in violation of federal law and shipped to Hobby Lobby Stores, Inc, a nationwide arts-and-crafts retailer. The artifacts returned were initially intercepted by U.S. Customs and Border Protection. The shipping labels on these packages falsely described the cuneiform tablets as tile samples. After a review of the items and their documentation, ICE Homeland Security Investigations Special Agents, in conjunction with Assistant U.S. Attorneys at United States District Court for the Eastern District of New York conducted interviews of a number of Hobby Lobby employees between January and June of 2016 which led to the discovery of a deliberate intent by employees of the company to avoid using a customs broker for the artifacts related to this transaction.